On view through April 14, 2013, The Walt Disney Family Museum’s special exhibition celebrates Walt Disney’s first feature-length animated film: Snow White and the Seven Dwarfs. The exhibition showcases more than 200 works of art including conceptual drawings, early character studies, detailed story sketches, and animation drawings. Also featured are delicate thumbnail layout watercolors, meticulously rendered pencil layouts, rare watercolor backgrounds, colorful cels, and vintage posters all illustrating how Walt Disney advanced the creation of an entirely new art form. Generous support provided by Wells Fargo. Between Frames explores the evolution of stop motion animation in the United States in special effects, television, and film. The exhibition highlights behind-the-scenes photographs, rare armatures and puppets, and original storyboards from cult favorite films and television including King Kong, Gumby, Star Wars, Jurassic Park, Robot Chicken, and Tim Burton’s The Nightmare Before Christmas and showcases stop motion innovators like Ray Harryhausen, Phil Tippett, Will Vinton, Tim Burton, Henry Selick, and more. Perhaps no other film library showcases Americana more than the one created by The Walt Disney Studios. 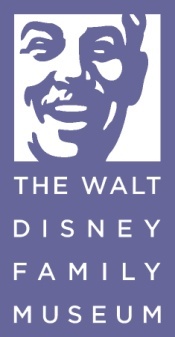 Ever careful to preserve this collection for future generations to enjoy, the Disney Studios has maintained the pioneering spirit of Walt’s dedication to exploring new technologies. Theodore Gluck, the Studios’ Director of Library Restoration and Preservation, will present an exclusive look inside the processes used to bring these beloved films to a contemporary world. Starting with the development of Technicolor and continuing through the early days of CinemaScope, Gluck will demonstrate the challenges now faced by the Studio Restoration Team as they work to restore these world-renowned films to their original splendor. (This program is presented in conjunction with the Museum’s feature exhibition, Snow White and the Seven Dwarfs: The Creation of a Classic). Hear expert highlights of our special exhibition, Between Frames: The Magic Behind Stop-Motion Animation. Drawing from The Walt Disney Family Museum’s collection of priceless Disney animation cels, Museum art conservator Martin Salazar will discuss how these cels were first created, explain the causes of cel deterioration, and demonstrate techniques he has developed to care for these treasures. Salazar will also discuss the ethical challenges faced by institutions when attempting to preserve fragile artifacts. The lecture will conclude with a guided tour of the Museum’s first major exhibition, Snow White and the Seven Dwarfs: The Creation of a Classic. Salazar will be assisted by Museum conservation technician Harvey Newman. This class is for participants ages 18+, all levels of experience. Space is limited. Registration required. Email: education@wdfmuseum.org to register or for more info. Ruben Esqueda, independent filmmaker and animation mentor since 1998, will lead a hands-on four-hour master class for animators at all levels of experience. Participants will learn the process of building a professional quality stop motion puppet armature, which will be ready for use in animation by the end of the class. Participants will also learn other types of puppet construction including wood, ball and socket, and prefabricated toy puppet armatures. The class will involve the use of wire-cutting materials and epoxy, so comfortable dress is recommended. Create stop motion animation in our Media Studio and try your hand at two early steps of creating an animated film—storyboards and concept art—in our Art Studio. Hours: 10am to 6pm, Wednesdays through Monday; closed on Tuesdays and the following public holidays: New Year’s Day, Thanksgiving, and Christmas Day.